Let’s make some more aberrations! A few weeks ago I made the case for needing more high challenge rating aberrations than the ones in the Monster Manual for my soon-to-be-published Exploration Age campaign setting. There’s only 19 total aberration stat blocks in the book, and the highest CR is 14 (beholder in lair), so you might want some more aberrations for your world too! That’s why I’m sharing them on this blog. In that post I showed off the Lovecraft-inspired moonbeast. Then in a later post I presented my hound of Tindalos. In this post I’m showing off my fifth edition Dungeons and Dragons version of the gug! Gugs are fur-covered, vertically mouthed, bug-eyed, spindly limbed giants. These horrifying creatures are constantly hungry and able to fit in almost any space. The aberrations stalk deep underground tunnels for unsuspecting prey. Driven by Hunger. The gugs’ strange metabolism means the beast is always hungry. As such these alien monsters eat anything that has flesh – living or undead. They will even eat another gug if starving, but the creatures are civilized and only resort to such actions when desperate. Smart Stalkers. Gugs’ hunger keeps them on the prowl, making them dangerous hunters. Practiced gugs surprise their prey by using their odd, flexible anatomies to drop from impossibly high cave ceilings and leaping out of tiny crevasses. Gugs are used to feeling hungry, so they are patient when hunting, waiting for days clinging to a wall or shoved into a crack. Cities of Gugs. Gugs live together in the deepest underground caverns in enormous cities of massive towers. A single king or queen has absolute control over the lives of all the other gugs in the city. When the gugs return to the city after a hunt, they must bring a portion of each kill to the monarch. Speed 50 ft., climb 50 ft.
Amorphous. The gug can move through a space as narrow as 1 inch wide without squeezing. Fall Damage Immunity. The gug can fall any distance and does not take fall damage. Horrifying Visage. Creatures who start their turns within 30 feet of the gug and can see the creature must succeed on a DC 16 Wisdom saving throw or become frightened of the gug for 1 minute. A creature can repeat the saving throw at the end of each of its turns, ending the effect on itself on a success. If a creature’s saving throw is successful or the effect ends for it, the creature is immune to the gug’s Horrifying Visage for the next 24 hours. Magic Resistance. The gug has advantage on saving throws against spells and other magical effects. Magic Weapons. The gug’s weapon attacks are magical. Spider Climb. The gug can climb difficult surfaces, including upside down on ceilings, without needing to make an ability check. Multiattack. The gug can make five attacks: four with its claws, and one attack with its bite or swallow. Bite. Melee Weapon Attack: +14 to hit, reach 5 ft., one target. Hit: 24 (3d10 + 8) piercing damage. If the target is a creature, it is grappled (escape DC 20). Until this grapple ends, the target is restrained, and the gug can’t bite another target. Claw. Melee Weapon Attack: +14 to hit, reach 10 ft., one target. Hit: 21 (3d8 + 8) slashing damage. Swallow. The gug makes one bite attack against a Medium or smaller target it is grappling. If the attack hits, the target is swallowed and the grapple ends. The swallowed target is blinded and restrained, it has total cover against attacks and other effects outside the gug. A swallowed creature takes 35 (10d6) acid damage at the start of its turn. If a swallowed creature dies as a result of taking acid damage from this ability, the gug regains 50 hit points. 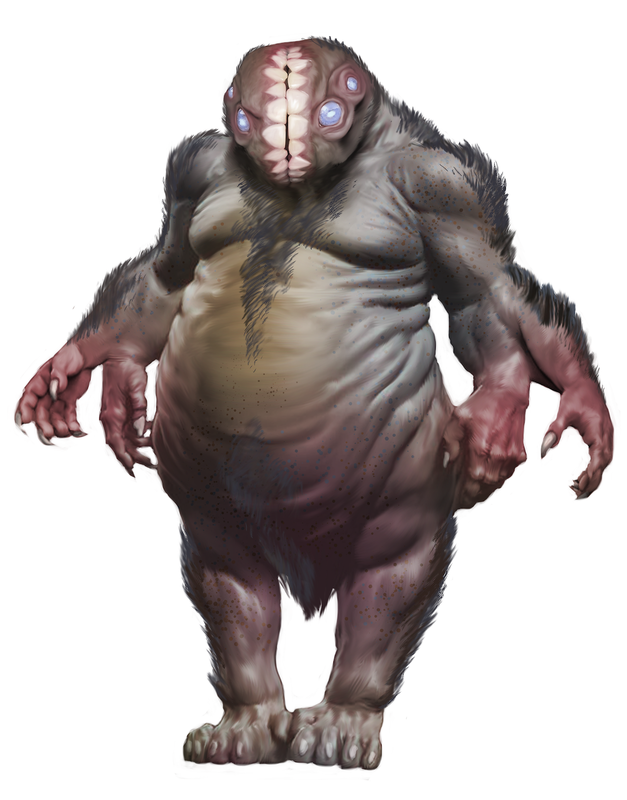 If the gug takes 50 damage or more on a single turn from a creature inside it, the gug must succeed on a DC 15 Constitution saving throw at the end of that turn or regurgitate all swallowed creatures, which fall prone in a space within 10 feet of the gug. If the gug dies, a swallowed creature is no longer restrained by it and can escape from the corpse using 15 feet of movement, exiting prone. Would you like this Lovecraftian beastie to threaten your players’ characters? Grab it now in its own PDF or alongside a lot of Exploration Age’s monsters! Like the icebreaker shark, gaping maw, morchia, and mystauk. If you liked these creatures be sure to check out my other offerings in the Free Game Resources section of this site and my Pay What You Want products on the DMs Guild for backgrounds, magic items, optional rules, and more. Now I ask you my readers to please go forth and test this nasty. Throw it at your players and see how they fare! If you have any feedback for my monster please leave it in the comments below or email me (james.introcaso@gmail.com). If you tell me your name and the names of your players I’ll give you credit as playtesters in the Exploration Age Campaign Guide! This is your best Lovecraftian horror yet. Its going to be a loong time before my players can face one and hope to defeat it. That doesn’t mean they may not encounter one or learn of one sometime soon. Bwahahahahahaaaaaaaaaaaaaaaaaa! Do you take requests? I would like to see what you do with a Dark Young (not directly a Lovecraft invention, I know, but implied). Also are you considering designing spells for use with these creatures? The Hound for example can certainly be summoned and set on the trail of particular prey. I certainly take requests! I’ll look into it for sure!!! I like it, but I’m not sure how they fit in narrow spaces without squeezing… can they turn 2-dimentional? Thanks! They’re alien and weird! It made sense for creatures that lived underground so I went with it. How does a beholder fly?